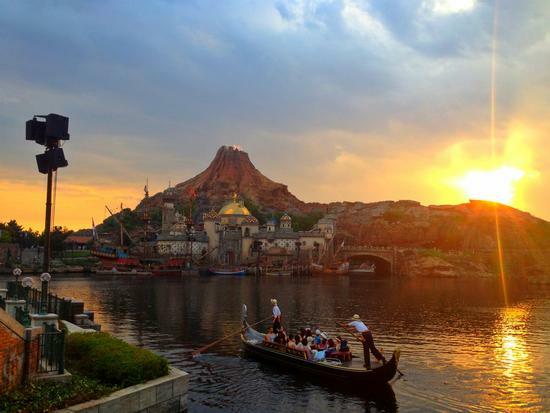 August 20, 2013, 1:22 PM · In the realm of theme park dining, Tokyo Disneyland and Tokyo DisneySea have quite a reputation. When planning my trip to Disney's Japanese outpost, the most frequent dining advice that I was given was, "Eat anywhere. Everything's good." Yeah, uh-huh, sure. But my skepticism was thwarted by the Tokyo Disney Resort restaurants' outstanding service, cleanliness, efficiency and — most importantly — food! It's not by accident that DisneySea's fabulous S.S. Columbia Dining Room was named Theme Park Insider's Best Restaurant for 2013. But instead of discussing the many wonderful sit-down establishments at these two parks, today we're sweating the small stuff: snacks. Before we snack our way through Tokyo Disney, I should explain that Japan is not a grab-n-go culture when it comes to food or drink. For instance, Japanese Starbucks franchises offer a "short," which is a tiny coffee that commuters buy, stand there and gulp, then continue on their way to the office (as opposed to the millions of Americans that you see toting Starbucks cups everywhere). It seems that this idea is relaxed a bit in the Tokyo theme parks, where we sometimes witnessed guests walking with ice pops or popcorn. But, more often than not, visitors bought their snacks, found a spot to sit where they could enjoy their purchase (or simply stood next to the snack stand and chowed down), and then moved along. With the exception of a Fastpass time crunch, we did our best to follow the local custom. Of course, another local custom (when it comes to Tokyo Disney, at least) is the popularity of any food that is shaped like Mickey's head. There was Mickey-shaped mac and cheese, Mickey-shaped chicken fingers, even Mickey-shaped churros. We were not immune to the charms of these round-eared delights, and found ourselves indulging in a giant, Mickey-shaped waffle topped with vanilla ice cream and mango (680 yen, or about $7), the seasonal special at the Great American Waffle Company. While waiting in a short line, we watched workers flip the Mickey waffle irons, ensuring that the treats were never in short supply. A minute after ordering at the counter, our waffle arrived, fresh and hot, crispy on the outside and soft and light on the inside. It was topped with a zig-zag of maple syrup and surrounded by whipped cream, custard, ice cream and chopped mango (none of which were generous servings, but enough to get the job done and all plenty delicious). Just around the way from the Waffle Company is Boiler Room Bites, a snack stand seemingly built out of the wreckage of an old ship (with the boiler room turned into a kitchen). The Adventureland outpost is home to the Mickey-Shaped Steamed Bun filled with pork and chicken (400 yen, $4.10). Craving something savory, we opted for this option over the Minnie-shaped bun with strawberry and milk. We were thrilled with our decision; not only was the bun warm and soft, the fillings were rich and plentiful. The Mickey shape doesn't just offer a gimmick, but an interesting way to deliver different flavors — the ears were packed with barbecue pork, while the head was filled with teriyaki chicken. And with a Japanese heat wave in full swing, we couldn't stop ourselves from a few snacks to help us cool down. Instead of the Mickey-shaped ice cream bars found all over Disneyland and Walt Disney World, the Tokyo parks offer Mickey- and Minnie-shaped, fruit-flavored ice pops. In DisneySea, your options were tropical fruit (Mickey) or peach and raspberry (Minnie), and in Disneyland, you could choose between orange (Mickey) and pineapple (Minnie) — all 300 yen ($3.07). They were pretty huge, delicious and refreshing — as was the 300 yen frozen mango. But it's not Mickey-shaped, so where's the fun in that? Another one of Tokyo Disney's unique offerings is the Tipo Torta, which consists of a dense, sweet cream wrapped in long, thin layers of pastry dough. At the time of our visit, the Tipo Tortas were available in three flavors: strawberry and caramel (available at the Village Pastry wagon in Fantasyland at Disneyland) and honey-lemon (available at Tropic Al's stand in Lost River Delta at DisneySea). We tried the caramel and honey-lemon versions (each 350 yen, $3.60), and both were akin to having an ice-cream sandwich in churro form. The honey-lemon flavor was more complex and worked better than caramel as a cold treat. Snack stands aren't the only place you can treat your sweet tooth at Tokyo Disney. One of my absolute favorite dishes during my time at the parks came as a side item at the Queen of Hearts Banquet Hall — which is worth a stop for a meal or a snack, if only to check out the brilliantly decorated dining room, themed to "Alice in Wonderland." While passing through this crowded-but-efficient buffeteria, I added a cup of Chilled Cream of Purple Sweet Potato Soup (400 yen, $4.10) — maybe because if you're going to eat in Wonderland, you ought to have something that looks like the Cheshire Cat. The gamble paid off — the soup was silky smooth, with a surprising depth of flavor as sweet and savory layers intermingled. If this dish had been as readily available as ice pops or churros, I would have probably indulged in another bowl each day. And what would a trip to the Tokyo Disney Resort be without daily (or hourly) doses of the parks' creatively flavored popcorn? During our trip, the two parks were offering 11 varieties of their famous corn. Unlike most Japanese visitors, who carry their popcorn in souvenir tubs shaped like Mickey or the "Toy Story" aliens or the oh-so-popular Duffy, we opted for the 300 yen ($3.07) regular size, in order to taste as many flavors as possible. In the end, we tried eight versions — because who can get excited about Salt or Caramel when you can try Milk Tea and Corn Potage? Speaking of Corn Potage, it might have been my favorite. Available exclusively in Toontown, this popcorn was covered in a bright yellow candy coating that gave it the flavor of sweet corn soup. Apparently, I really like my corn with extra corn — can you tell I'm originally from the Midwest? Another big winner was the Curry popcorn, available in Adventureland in Disneyland and in Arabian Coast in DisneySea, where we grabbed a box. The mixture of spices provided plenty of kick, but was restrained enough not to wear out its welcome. Unlike the Black Pepper (which became a bit one-note, flavor-wise), the Curry corn kept us coming back. It reminded us of something we had at Memphis's rib mecca The Rendezvous — a legendary barbecue establishment that sells popcorn coated in their secret spice rub. As for the other flavors, Honey (two locations in Fantasyland, with one by — what else? — Pooh's Hunny Hunt) was predictably delicious and Strawberry (Port Discovery, although you can smell it from Mysterious Island) was wonderful with a more delicate sweetness than most, cloying strawberry candies. Even more delicate were Milk Tea (the Cape Cod section of American Waterfront) and Apple Cinnamon (the harbor section of American Waterfront). The Milk Tea's subtle mixture of sugary and salty flavors was a nice balance, but I expected a little more oomph from the Apple Cinnamon corn. Although I was hoping for a revelation with the Soy Sauce & Butter flavor (Adventureland and Tomorrowland), I didn't get it — although the butter and salt flavor profiles were a good match, as you'd expect. (I'd find my sublime Soy Sauce dessert delight elsewhere in Japan when I tried Soy Sauce ice cream.) As I said before, Black Pepper was a one-note flavor — but it was a fine note, with taste-bud tingling pepper dispersed nicely on every kernel. 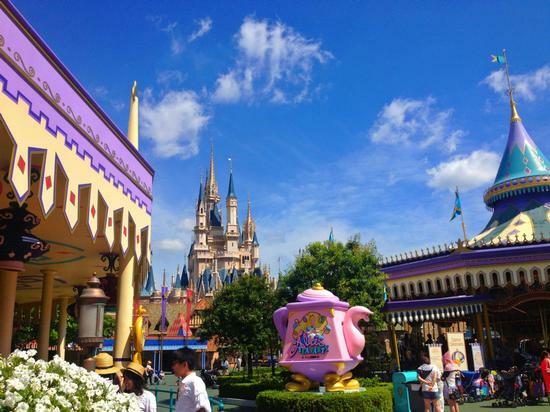 So, what did we learn as we snacked our way through Tokyo's twin Disney parks? Purple potatoes can make for a soup that'll make you grin like the Cheshire Cat. The Mickey shape provides a creative way to get additional flavors into a steamed bun. Some extra corn can lend corn-flavored popcorn some extra pop. And, finally, instead of scarfing your snack while jetting around the parks, it's nice to have a seat, enjoy your food and revel in a quiet moment — even if it's in the middle of Toontown. August 20, 2013 at 1:23 PM · Great report, Bryan. Thanks! Here are a couple more snacks from Tokyo DisneySea that I want to mention: As much as Japanese visitors seem to love their Mickey-shaped snacks, they're absolutely obsessed with anything Duffy. If you can't understand why Disney merch executives can't let go of stuffing Duffy into their U.S. theme park stores, the money Disney's making off that character in Japan is the reason. Here's a chocolate-filled Duffy head from the American Waterfront land in DisneySea, which was Duffy Central when I was there. And my favorite snack at Tokyo Disney, save possibly the curry popcorn, was the Gyoza Dog from the Refreshment Station in the mind-blowingly amazing Mysterious Island land. It's a sausage and cabbage stuffed Gyoza, though its so big that the texture of the wrap is a bit more like a steamed bun. Anyway, it's absolutely delicious, which is why the line for these gets as long as some attractions after about an hour or so. Get one for breakfast, or prepare to wait. August 20, 2013 at 1:51 PM · Off topic, but does the lens flare in David's Tokyo DisneySea photo near the top of the post make it look like a Mickey-shaped sun to anyone else? It does to me. August 20, 2013 at 4:23 PM · I was particularly fond of the milk tea and curry flavored popcorn, while the others were decent but not quite my cup 'o tea- (didn't get to try the corn postage as it wasn't available when I was there, and didn't bother to try the pepper as I'm not a fan at all!). I also really liked the orange-cream hot version of the Tipo Torta - absolutely delicious (and one of the longest quick serve food lines I've ever waited in! ), though the Japanese seemed to prefer the barbecued pork version; as a vegetarian that wasn't an option for me. August 20, 2013 at 4:57 PM · I can't believe you missed the vanilla, chocolate and strawberry custard filled Toy Story alien dumplings! Those things were amazing. August 20, 2013 at 7:29 PM · Interesting report on a subject most of us are surely unfamiliar with. That was a really good idea to do a Tokyo park food report. August 20, 2013 at 8:29 PM · @Robert - Yes, the Cape Cod area of the American Waterfront is still Duffy Central, with a live show (My Friend Duffy), plenty of souvenirs, etc. The Japanese sure love their Duffy stuff. We saw little Duffy dolls clipped to backpacks throughout our time in Japan. @124... - Sorry I missed those, too! I've seen pictures and they look great. Oh well, you can't eat everything (try as I might...). August 21, 2013 at 8:55 AM · I don't understand why the flavored popcorn hasn't made its way Stateside. You'd think the Cozy Cone in Cars Land would sell at least one exotic flavor, but nope, just nacho cheese and butter. August 22, 2013 at 3:39 PM · Russell, I guess it depends on your definition of "exotic". Cozy Cone sells two flavors of popcorn, a butter(ed?) and a rotating one. Don't know that I've seen nacho flavor, but I've had a sweet and spicy one that was positively more of the latter. Mostly, though, I've seen dill pickle flavor. Not being a fan of pickle-anything, I passed on that.